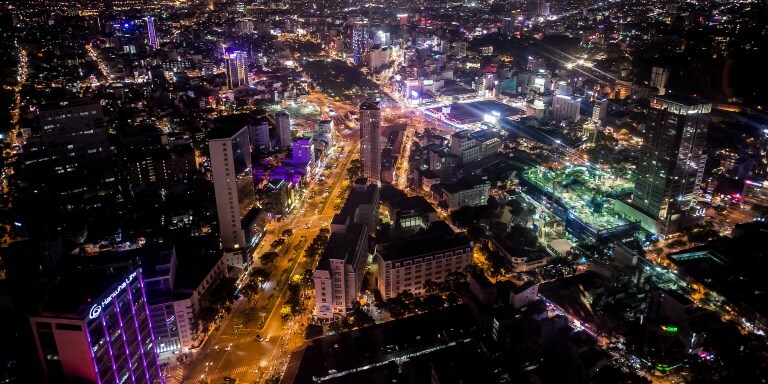 An overlooking view of the Ho Chi Minh City, Viet Nam at night. Photo credit: ADB. Governments need the right mix of policies and projects to reap the benefits of urban growth. By 2030, urban dwellers will make up majority of the world’s population. Urbanization can open more economic opportunities, particularly in Asia, helping governments pull the vulnerable out of poverty. However, many countries in the region are finding it hard to cope with rising demand for basic services and infrastructure in fast-expanding urban areas. At the 2016 Asian Bank-Asian Think Tank Development Forum, Michael Lindfield, director of Urban Infrastructure Services, Ltd., discussed the challenges for sustainable urban development in Asia and possible solutions for cities to become green, inclusive, and resilient. With more people flocking to cities, governments in Asia are grappling with the impacts of rapid urbanization on the environment, economy, and social development. And the poor and vulnerable bear the brunt of shortfalls in public services. Cities provide up to 80% of the economic base of many countries, but wide disparities have emerged. Over 200 million people live in poverty in Asia’s cities, and many more are vulnerable to economic and environmental shocks. Unfortunately, institutions are generally not yet capable of responding to the huge impacts of rapid urban growth. The potential of cities to drive economic growth and lift millions out of poverty in the region remains largely untapped because of this institutional weakness. Ensuring sustainable urban development is more than just building the necessary physical infrastructure. It also requires delivering basic social services in order to improve people’s lives. The focus should be on how cities can contribute to the economy, and how they can become more inclusive. To put it more simply, there is a need to identify and implement workable solutions that would help create livable cities. While there are challenges, it is also important to look at the brighter side of things. Asia’s economy continues to grow. A wealth of opportunities arises out of this economic dynamism that governments need to see and tap. One of the key constraints, however, is the lack of capacity to muster enough resources to put in place the required infrastructure in urban areas. Getting the right mix of policies and projects can help Asia overcome the challenges of sustainable urbanization. Governments need to address three areas—policy and planning, project development, and financing. Evidence-based planning needs to be done. Frameworks for planning should also be cross-jurisdictional, flexible, and responsive. Currently, policies are not coordinated at the different levels of governments, often making isolated efforts and responses futile. Governments also need to understand the role of the vulnerable in the economy and to include appropriate responses in the planning process. Such measures can both boost the economy and make cities more inclusive. The ADB-supported project, Strategic Private Sector Partnerships for Urban Poverty Reduction in Metro Manila, Philippines, for instance, jumpstarted collaboration among the local government, private sector, and homeowners’ associations. The three-year project opened opportunities for microenterprises, improved community infrastructure, and increased disaster preparedness. The capacity to design and finance good-quality projects must be developed. Poorly formulated and procured projects can both harm the environment and the poor, affecting the sustainability of urban areas. Project development processes should systematically address options for ‘’greening’’ infrastructure and ensure that the poor and vulnerable benefit. They should also maximize financing options to find the most efficient and lowest cost of providing infrastructure. Options for funding urban infrastructure include public-private partnerships, which help governments secure greater private investment in infrastructure. The Lanzhou Bus Rapid Transit system in the People’s Republic of China provides an example of effective public-private partnerships, which has financed the construction of retail and public spaces and pedestrian passageways with security cameras in the bus rapid transit corridor. Providing an enabling environment for long-term financing options is also important, but governments must address the necessary policy reforms systematically. It also pays to explore alternative options involving capital market instruments and other available mechanisms of long-term financing. For example, some governments encourage insurance companies to buy bonds issued by urban development and infrastructure companies. Governments need to understand the role of the private sector in building sustainable cities. Aside from providing debt and equity financing, the private sector can help address the issues of social inclusion and environmental sustainability. ADB. 2008. Strategic Private Sector Partnerships for Urban Poverty Reduction (STEP-UP) in Metro Manila. Urban Innovations Series. Manila. ADB. 2016. GrEEEn Solutions for Livable Cities. Manila. Lindfield, Michael. Challenges for Sustainable Urbanization. Slideshow presentation at the 2016 Asian Bank-Asian Think Tank Development Forum. New Delhi. 27–28 October 2016. Director, Urban Infrastructure Services, Ltd.
Michael Lindfield has over 30 years of experience in international sustainable urban development. He previously served as chair of the Asian Development Bank's Urban Community of Practice and program manager of the Cities Development Initiative for Asia. He holds a doctorate in Economics from Erasmus University Rotterdam in the Netherlands.